The Marcos family doesn’t owe the Filipino people an apology over the the late dictator Ferdinand Marcos’ imposition of martial law, Senator Miriam Defensor Santiago said on Friday after she filed her certificate of candidacy to run for president in 2016. Santiago, however, disagreed that the details of what transpired during martial law should already be relegated to the background in favor of addressing the country’s current problems. “I don’t think that on a family basis, the Marcoses as a family owe us an apology. In the first place, it was not the case that President Marcos the father pooled all the Marcoses in one table and they all decided jointly to do certain activities,” Santiago said in a news conference at the Commission on Elections. “That was not the case…. This was all a result not of a familial discussion but a result of policy decisions of the executive department of the government—President Marcos and his advisers,” she added. 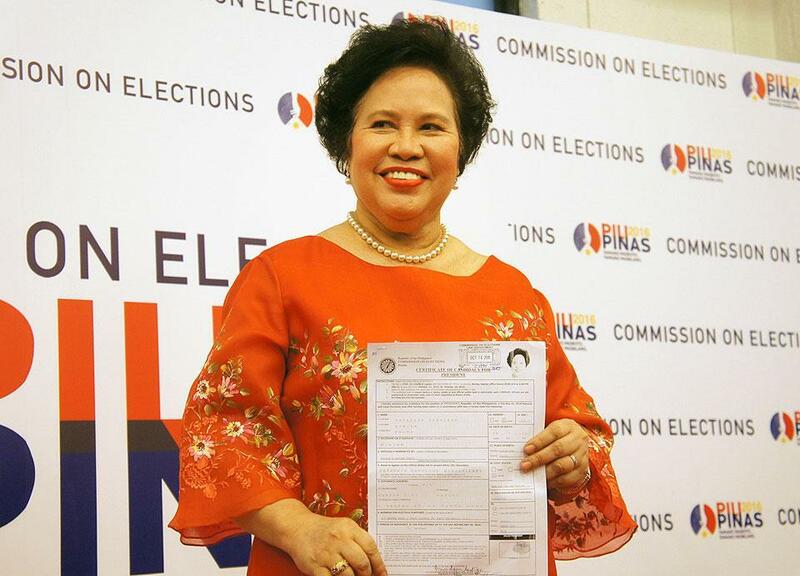 Santiago is running for president for a third time since 1992 and has chosen Senator Ferdinand “Bongbong” Marcos Jr., the sone and namesake of the former strongman, to be her vice presidential candidate. Santiago, however, said she did not agree with remarks attributed to Bongbong that people should discuss present-day problems rather than the past. “Things that happened in the past need to be validated, so it’s really important to go over the details of Martial Law,” Santiago said. “I would disagree with Mr. Marcos that the details of Martial Law would have to be buried or forgotten. No. On the contrary, the historians of tomorrow should make the study deeper so they’ll know the importance it holds,” she added. “In the first few years, there was much more order in the streets, but eventually I think that Martial Law did not proceed as intended,” Santiago said. She told reporters she did not backtrack from decisions she made as Regional Trial Court judge during the Martial Law period. She said one of the memorable decisions she made was releasing students from the University of the Philippines and the Ateneo de Manila University who were arrested at the time. “You ask me, ‘Do you still affirm the decision you made in court?’ Yes, I do. I was correct… Truth is still truth, justice is still justice,” she said.